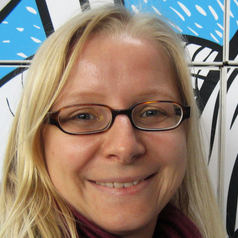 Stine Eckert (Ph.D., University of Maryland) joined the Wayne State journalism faculty in 2014. She received her Ph.D. from the University of Maryland and her Master’s of Science from Ohio University after studying journalism studies, communication and media studies and American studies at the University of Leipzig, Germany. She earned a Certificate in Graduate Studies from the Women’s Studies Department of the University of Maryland. Her research interests include international, comparative work and the intersection of social media, minorities and gender as well as the democratic potential of social media. She has published articles in International Journal of Communication; Media, Culture & Society; Journal of Communication Inquiry and Journalism: Theory, Practice & Criticism. She co-authored the chapter “Wikipedia’s Gender Gap” in Cory Armstrong’s (Ed.) Media Disparity: A Gender Battleground (2013). Eckert also co-founded the Wikid GRRLS project to teach middle and high school girls how to create content on knowledge sharing sites such as Wikipedia. More information about her work and projects is available on stineeckert.com and on Twitter via @stineeckert.